Summary: This game demonstrates the advantages of price allocation over other methods. Students are told that a hurricane has caused a major power outage. This increases the demand for ice, since homeowners want to use it to preserve food. It also decreases the supply of ice, since many local ice producers won't be able to make ice without power. This combination of an increase in demand and decrease in supply causes the equilibrium price of ice to go up. In the first round of the game, however, the price of ice is frozen at the pre-hurricane level and allocated on a first-come, first-served basis. In the second round, the ice is allocated by price, with no waiting. Between 15 and 38 students. 38 identity cards, 38 wait cards, and a transparency of the Figure 1 graph. Click here to download the cards and graph in pdf format. Before the game begins, the identity cards should be put in numerical order with #1 on top. Count out as many identity cards as there are students in the class, and put any extras away. Shuffle the cards very well, then verify that at least some of the cards near the top of the stack (which will go to the students near the front of the line) show only small benefits from the ice. If not, shuffle again or plant two or three cards showing small benefits near the top. Put the wait cards in order of the length of the wait, with the shortest times on top. Count out as many cards as you have students in the class, and put any extras away. Don’t shuffle the wait cards. Have your students draw supply and demand diagrams for ice, assuming an initial equilibrium price of $1. Next, tell the students that a hurricane has swept through the city and that the power will be out for several days. Have them show on their diagrams how the supply and demand curves will shift. (The demand curve will shift to the right since people will want ice for their refrigerators and freezers. The supply curve will shift to the left since it requires power to produce ice.) Finally, ask them to assume that the price of ice is frozen at $1 per bag, and to show on their diagrams the shortage that would result. Explain that ice will be sold on a first-come, first-served basis at a price of $1 per package, and that each customer can buy only one package. Tell students to form one long line at the “ice shop,” and then give one identity card to each student. Next, give each student a wait card, so that the first ones in line get the shortest wait times and the ones are the end get the longest. Every student gets in line at the "ice shop." Once they receive their identity cards and wait cards, many will decide to sit down rather than wait. 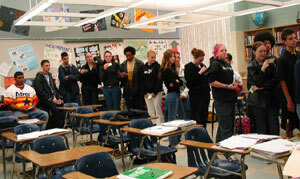 After you’ve distributed the cards, tell the students that it may not be worthwhile for some of them to wait in line. To find out if they should stay or leave, have them compare the benefit they’d get from the ice with the cost. The cost is equal to the price of the ice ($1), plus the opportunity cost of the time they would have to wait to get the ice (i.e., the opportunity cost per hour times the wait time). If the benefit equals or outweighs the cost, they should stay in line. If not, they should take their cards and return to their seats. Tell students to assume that all wait times remain the same even after the line becomes shorter as students sit down. Pass out “ice” (candy) to the first five students in line, and have them remain at the front of the class. Tell any students remaining in line that you’ve run out of ice, and have them return to their seats. These students remain in line since the benefit they expect to get from the ice exceeds the opportunity cost. They don't yet realize that the ice shop only has enough ice for 5 students and that some of them will leave empty-handed. Make a table on the board labeled “First-Come, First-Served Allocation” and with column headings of “Why I Want the Ice,” “Benefit of the Ice,” and “Cost of the Ice.” Ask the five students who got ice to fill in the rows of the table, as shown in the table below. Have them return to their seats when they’re done. Tell the students that you’re now going to allocate the ice by price instead of by first-come, first-served. There will be no lines and no waiting. When deciding whether to buy ice, students should now compare the benefit of the ice to just the price. Display Figure 1 (See materials section to find out how to download it) on an overhead transparency. Show students that the quantity supplied increases as the price rises. Ask them to explain why. They should answer that the higher price will encourage suppliers to use more costly means to bring ice to market, say by using generators to make ice, or by trucking ice in from other areas. Next have all the students stand by their desks. Tell them that you’re going to raise the price until the quantity supplied equals the quantity demanded. Tell students that they’re to sit down when the price of the ice exceeds the benefit to them of the ice. Start with a price of $1. Each student in the classroom should want to buy ice at that price. Mark a point on the diagram showing a quantity demanded equal to the number of students in the class. Keep raising the price in increments of two dollars (i.e., to $3, $5, $7, and $9) until you’ve reached the equilibrium price ($9). At each new price, tell any students who are “priced out of the market” to sit down, then ask these students to tell the class why they’d wanted the ice and what benefit they would have derived from it. Count the students who are still standing and record that amount as the quantity demanded at that price. At a price of $5, 16 students are still standing in this class of 26. When the price hits $9, only 9 students will be standing. At that point, the quantity supplied will equal the quantity demanded. When you reach the equilibrium price, give “ice” to the nine students who are still standing. Make another table on the board labeled “Price Allocation,” and with column headings of “Why I Want the Ice,” “Benefit of the Ice,” and “Cost of the Ice.” Have the nine successful buyers fill out the table, as shown in Table 2. Conclude the lesson by having your students discuss which allocation method did a better job. 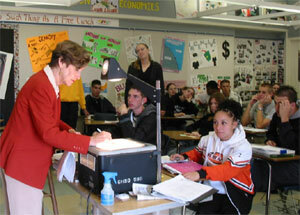 Teacher Eleanor Allen of Foothill High School in North Highlands, California, polls the 9 students who remain standing when the price of ice hits $9. In addition to demonstrating the advantages of price allocation, the game can be used to illustrate several other concepts: (1) that the opportunity cost of time affects decisions; (2) that consumers compare costs and benefits when making decisions; (3) that demand is related to marginal benefit; (4) that a price ceiling will result in a shortage; and (5) that there’s a trade-off between efficiency and equity.